This 6 x 8 reverse apex overlap wooden shed is a tough and durable little building, and primarily works hard to keep your belongings safe and dry. This is down to the overlap cladding, which really works hard to prevent the entry of rainwater. However, there is also sand felt in the roof structure. This particular surface bonds against water, so you have a guarantee of no water entering the roof area. In all this is one shed that is going to meet your storage needs and look good in the process. With its window and single door this is a shed that makes a very nice and positive first impression. Most sheds of this size and of course price range are made with storage in mind first and being aesthetically pleasing second. But that is not the case with this gem of a shed. We love the design that Waltons have done with this and while of course how much storage space a shed has is important, you do not want some eyesore sitting in your garden. That is an issue you will not have with this shed we can assure you of that. It’s overlap cladding as well as making sure this is a very secure shed that will stand up to the elements makes for a very nice looking design. 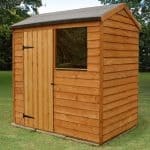 We have put many sheds through their paces and it is hard to think of another shed at this price range that looks just so…….. nice. Nice may not be a tough word or word you would associate with some, hard and sweaty DIY, but it perfectly sums up this shed. One person could look at this and see it as a small workspace or a home for tools. Another person could view it as a shed they can hang flowers from and make a real centre piece of their garden with. We really do not think that anyone would be disappointed once they have built this and then taken that first look at their new shed. 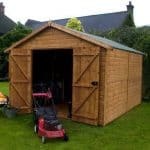 Even from photos this is a shed that gives a very strong first impression, but just below we have what you need to know about how sturdy, practical and just in general how good value for money this shed is. Look we know that the depth may cause your eyes to pop out of your head like a cartoon characters, but just remember that this is a shed that is all about width not the depth. You still have a good amount of floor space here and the height is not shabby either. Having to be “side on” could perhaps cause some issues with some gardens so keep that in mind. 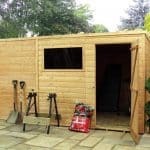 6 x 8 Waltons Reverse Overlap Apex Wooden Shed: How easy to build? Your 6 x 8 Waltons Reverse Overlap Apex Wooden Shed as is the case with other Waltons sheds will come to you flat packed and with all the screws in their own little baggies. The instructions sometimes can be a little bit confusing we will admit, but using some common sense and checking pictures for reference will keep you on track. 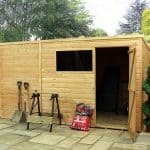 Build time on a shed like this is around the 5-7 hour mark depending on how skilled you are at DIY. One thing we will say is be sure to have some help with you as this will make your life so much easier. Even if the person helping you is just there to hold things which will come in handy when doing the roof, you will finish quicker and the shed will be built more sturdy than you trying to do everything yourself…… and if you have someone helping you, you can always send then into the house to get the coffee in! As with most DIY projects, taking your time, following the instructions and trying not to get frustrated will get you through it. 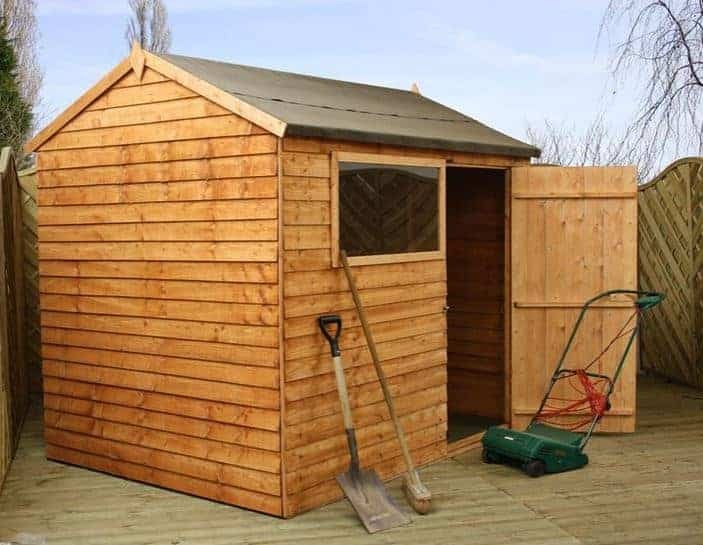 6 x 8 Waltons Reverse Overlap Apex Wooden Shed: How Safe & Sturdy Is The Shed? Overlap cladding is kind of like the superhero of the shed world (whether it is Hulk or Wolverine we are not quite sure)as it makes certain that no water will be getting into your shed and ruining your stuff. The window is made from 2.5 mm thick Styrene which as well as looking nice is also durable enough to take on the kids when they are playing with balls in the garden. The floor and the roof of the shed is made from solid sheet board with the floor being 10 mm thick and the roof 8 mm thick. We are more than happy with this and the floor will be strong enough for your storage needs (well unless you are storing a 1940’s steel safe with millions of pounds in it) and the roof will be up to the task of taking a beating from the elements. Speaking of the roof we know that the roof is probably the biggest concern for people when they are building a shed. And one thing that we really loved about the 6 x 8 Waltons Reverse Overlap Apex Wooden Shed was that the roof has sand felt covering which is perfect for our “awesome” British weather of rain for about 8 months of the year. We know leakage is a major concern, but sand felt loves water, will bond with it and keep it out of your shed. While this is a lovely looking shed, you could even say that it looks kind of timid and soft. This is still one tough cookie and like other Waltons sheds this bad boy as well as looking good can take a bit of abuse which like any good shed it is sure to do over the years. Once built you can give it a good shake and you will see right away just how strong and sturdy it is. The overlap cladding is 8 mm thick and while that may not sound a lot it is actually very tough and as well as keeping water at bay will not mind getting the odd football, hula-hoop or even radio controlled helicopter (yes this actually has happened) slammed into it. 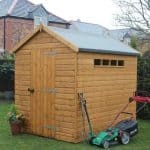 6 x 8 Waltons Reverse Overlap Apex Wooden Shed: What Is The Guarantee Like? Waltons offer a very impressive ten year guarantee with this shed like they do their others. It tells you a lot about a company when they offer this kind of guarantee. Well as great as this is please note that you are responsible for treating the shed with the right paint or some kind of timber treatment to actually “activate” this guarantee. This is explained to you in the “literature” that comes with the shed. We have encountered many people over the years who when the build a shed have the intentions to treat it ,but keep putting it off and off and off….. until it is too late and they find they are not covered…. Morale of the story is, make sure you treat your shed! What a nice looking and deceptively tough little shed this is. 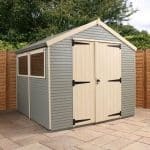 It ticks all the boxes of what makes for a good reliable shed and that price it comes in at makes you like the look of it even more. 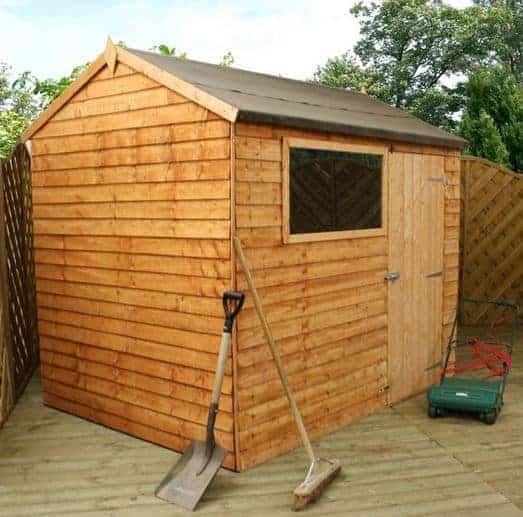 This is a shed that when painted, perhaps with a hanging basket or some other kind of decoration really will be something you are proud to have in your garden.